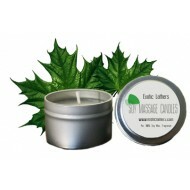 Introducing Exotic Lathers New Collection of All Natural 100% Soy Massage Candles. Experience the best of both worlds when you use our Soy Massage Candles. Beautifully Scented to match our Body Bliss Collection, simply light and let it melt. Blow it out and pour it on to experience the best soy massage. The melting point of our candles is just a few degrees above body temperature so you can immediately pour the melted candle onto your skin for a warm soothing massage. Cranberry Vanilla Peach Soy Massage Candle.&n.. Lavender Lemongrass Soy Massage Candle. ..